Around St. Patrick’s Day, I start the cool season veggies and herbs from seed in containers on the deck. You would be surprised at how easy it is to grow lettuce, cilantro, or scallions in small containers with little depth. It is best to use plastic as opposed to terracotta during cold weather but any container with drainage holes will work. 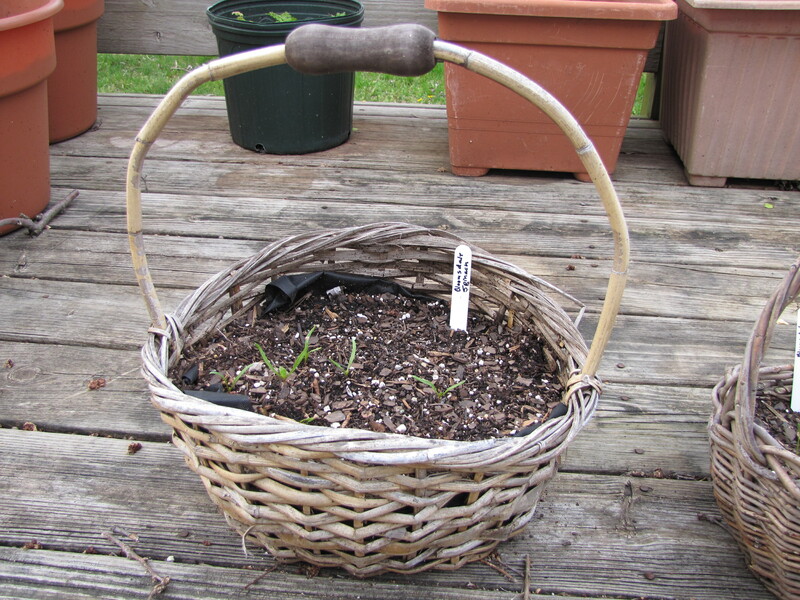 I have used old Easter baskets, straw baskets, wooden crates that once held tangerines (lined the large gaps), and recycled plastic plant containers from the nursery. You only need about 6 inches to grow lettuce, spinach, cilantro, kale, red radishes, arugula, chives, and the Asian leafy greens such as tatsoi and mizuma. Except for the radish of course, which is a small bulb like root, these plants have fibrous root systems that do not extend too far down into the soil. The actual plant is fairly short so the plant won’t topple over in a small container. If you have a larger container with more depth, say 8 inches, you can extend the possibilities to baby carrots, scallions, small onions, chard, broccoli raab, pak choi, chervil, and parsley. Fill the container with potting soil, making sure you have drainage and aeration, sprinkle a few seeds on top, lightly cover with soil (read seed packet about this), water, and place in a sunny place. Bagged potting soil never has enough aeration for me; I always add perlite (the small white pellets) to increase aeration. To deter squirrels, I sprinkle blood meal on top of the soil. Blood meal is what it is: dried, powdered animal blood, typically from cows. Fortunately, it is not red; it is a black powder that contains a small amount of nitrogen (which is beneficial for the plants). The smell deters squirrels but it has to be re-applied after heavy rains. My pots are on the deck for easy access but they could be on the ground as long as they are in the sun and near a water source. Don’t forget to put a label in the pot and record what you planted (I am a big advocate of keeping records and writing everything down). The key is to keep an eye on the weather. It’s okay if the weather gets too cold because these are cool season plants but it is not okay if the seeds are allowed to dry out. Once the seed absorbs water, germination begins, the seed coat breaks open and the root grows out. If the seed does not get water anymore, it dries up and the germination process ends and cannot be “re-started.” So always imagine the top inch of the soil where the seed is and know whether it is moist from rain or your watering can. After you can see an inch or so of green, imagine that the root has sunk down a few inches and can draw up the water that is in the middle portion of the soil. Now imagine the middle portion and ask yourself if it needs water, that is, has it rained recently? Where I live in Northern Virginia, once the plants are growing, I can usually count on the rain to keep them well watered in the spring. 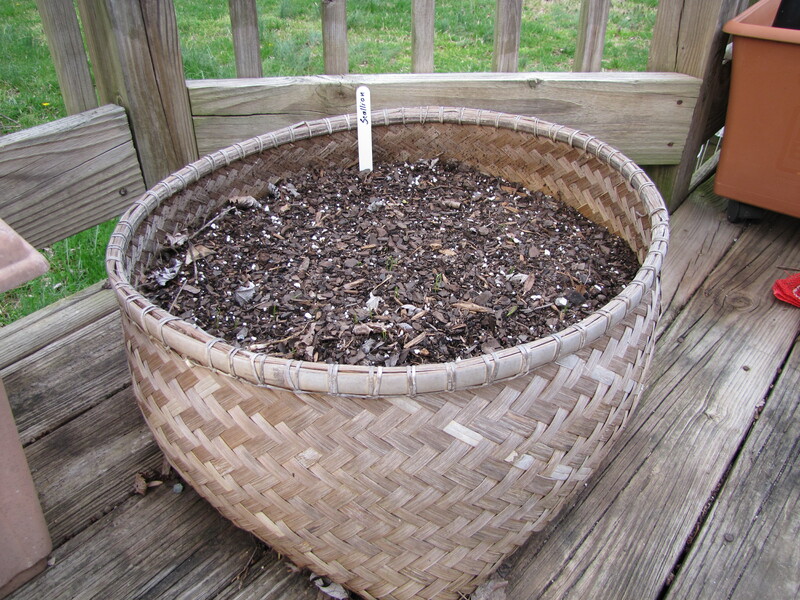 This entry was posted in Uncategorized and tagged containers, cool, herbs, pegplant, seed, veggies. Bookmark the permalink.